March 19, 2015: Bangladesh Prime Minister Sheikh Hasina (at R) holds the high cards in her Awami League government’s violent confrontation with an opposition coalition led by her longtime bitter rival Begum Khaleda Zia (at L), the leader of the Bangladesh National Party. But though Zia’s strategy of disrupting economic activity to force early fresh elections under a caretaker government has clearly failed, she is unwilling to give it up. Nor is an increasingly confident Hasina interested in coming to a compromise settlement, as some Dhaka-based diplomats have urged. She may in fact see the confrontation as an opportunity to crush the opposition both politically and physically. Both leaders are tough and unyielding women who have battled one another for decades. They run their parties with an iron hand and seem convinced of their own infallibility. The Bangladesh Army shows no interest in intervening, as Zia may have hoped. Prospects for an early resolution seem dim. Begum Zia has called for two types of action: a “continuous blockade” of inter-city traffic, which has produced considerable violence, mostly at the entrance to cities and major towns; and frequent hartals, or general work stoppages, which have had much less impact. Visiting Dhaka a few weeks ago, we found the city streets almost normal, nothing like the eerily silent scene Bangladesh old-timers like ourselves recognize as an effective hartal. The opposition’s tactic of enforcing the blockade by fire-bombing busses and trucks had backfired to the point where it felt compelled to blame these bombings on government agents. Victims appear to have largely been poorer people who had no other means of transportation. Though there had been some disruption of export shipments from Bangladesh’s vital ready-made garment factories, manufacturers had reportedly made local deals to ensure that their products were safely shipped to foreign markets. The BNP-led coalition had embarked on these violent tactics when they concluded that Hasina would not meet their demand for early elections run by a nonpartisan caretaker government. This unique system had been designed in 1996 to avoid rigging of elections by the incumbent party, as had occurred earlier. 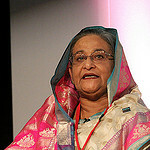 Hasina’s government scrapped it before the 2014 election and efforts to develop some kind of compromise arrangement that would allow the BNP-led coalition to enter that race failed. With the BNP boycotting, 153 of the 300 parliamentary seats went uncontested, and the election was widely (and correctly) viewed as a sham. 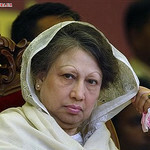 Although Hasina’s government had spoken vaguely of fresh elections, it moved away from this position and now insists that the virtually opposition-less parliament remain in office for its full five-year term. The BNP chose the first anniversary of the flawed January 2014 election to launch its agitation. The BNP has been prominently joined in the agitation by its coalition partner, the Jamaat-i-Islami. This Islamist party had been targeted earlier by Sheikh Hasina for its pro-Pakistan stand in Bangladesh’s 1971 liberation struggle, and several of its leaders have been hanged following trials conducted by a special court that many outside observers found had failed to observe international judicial standards. The JI provides a good deal of the BNP-led coalition’s muscle power, and areas in which the party was strong have featured prominently in the present agitation. With an eye to international opinion, Hasina’s government has alleged that the JI calls the opposition tune. This is an exaggeration, but it is certainly possible that the prime minister accepts it. Foreign governments, including the United States, have urged the two sides to work toward a compromise settlement, but have apparently avoided suggesting what one would look like. India has been conspicuously absent from this well-publicized effort. New Delhi has openly backed the Bangladesh government and has (incorrectly) suggested that the United States is pro-BNP. Washington had earlier moved away from its call for early, fresh elections and now takes the position that it is up to the Bangladeshis to work out their differences. Efforts by the international community seem to have had little impact on either side. The government is sitting in the catbird seat, and as support for the opposition’s confrontation fades it is in no mood for any meaningful compromise. Many opposition leaders have been harassed, imprisoned, or gone underground, and the BNP surely recognizes that its agitation has faltered if not entirely failed. But it is unwilling to accept terms that the strong-willed Zia will regard as an abject surrender, as they would in all likelihood be. It is a discouraging picture. Bangladesh’s economy – especially its dynamic garment industry – has developed to the point where some have spoken of its entering the ranks of middle-class nations. This is a far cry from the “international basket case” Henry Kissinger had reportedly called it in 1971. But the country has not made commensurate political progress. Since the overthrow of its martial law government a quarter century ago, it has at best been a classic “illiberal democracy” where elections under caretaker administrations are free and fair but are followed by “winner-take-all” governments in which a single party monopolizes power. The current struggle makes it even less likely that Bangladesh will move toward a more genuinely democratic political system.